How do I know which storm appears stronger? 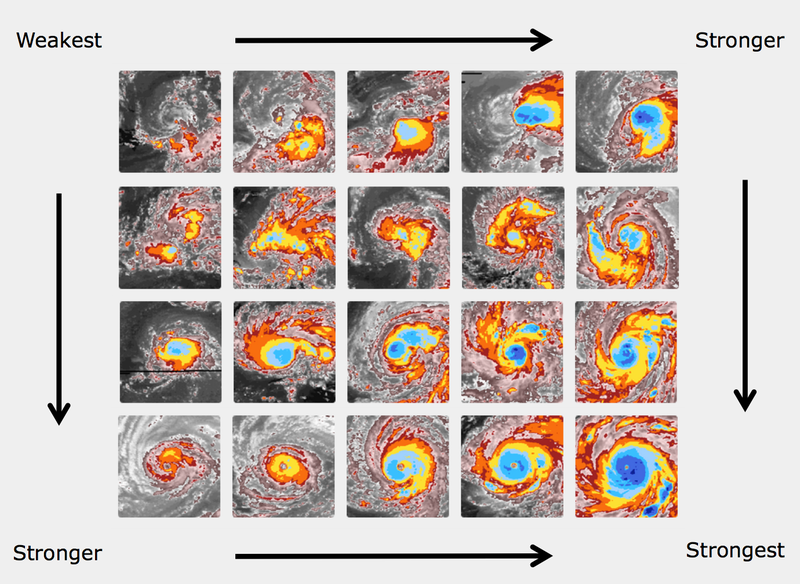 When Dvorak developed his method, he knew that you could tell something about a storm’s strength by looking at its lifecycle. If a storm looks stronger than it did yesterday, odds are that it probably is! That’s why the first step of most classifications is to ask which of two images look stronger. These are actually two images of the same storm taken within 24 hours. If the image you see is from the first 24 hours of the storm (or the image 24 hours prior is missing) then you’ll skip this step. We’ll use your answer to calculate something called the Model Expected strength. It starts with the storm’s strength from 24 hours ago. If you say the newer one looks stronger, then we’ll bump it up a notch. If the older one looks stronger, then we’ll bump it down. And if they’re about the same, then we just hold it constant. This isn’t as sophisticated as some of the other ways we estimate strength (see the upcoming posts on the Detailed Classifications), but it gives us a good first guess. 1. How cold are the clouds? The presence of more colder colored clouds in an embedded center suggest a stronger storm. Colder clouds surrounding an eye suggest a stronger storm. 2. How organized are the clouds? Stronger storms have spirals that wrap farther around the storm. The cold clouds near the center become more circular as a storm strengthens. Typically Shear and Curved Band storms are weaker than those with an Embedded Center. Storms with an eye are almost always stronger than storms without one. For storms with an eye, consider the shape, size and color of the eye. Eyes that are more circular, smaller and/or warmer tend to be associated with stronger tropical cyclones. In some cases, the storm on the left may appear to have some of these characteristics, while the storm on the right may appear to have others. If this is the case, they can actually cancel out, in which case we would say that they are about the same. For example: If the storm on the left appears better organized and more tightly-wrapped, but the storm on the right has more cold colors, you would say that they are about the same. You can use the images below to help you gauge a storm’s relative strength. I am a research meteorologist at the Cooperative Institute for Climate and Satellites (CICS-NC). I explore tropical weather patterns to better understand and predict how hurricanes and other tropical cyclones form. My fascination with hurricanes began when Hurricane Fran struck my hometown of Raleigh, NC in 1996.